The book of Nehemiah is the story of the returned remnant that came back to Jerusalem after seventy years of captivity in Babylon. Both Ezra and Nehemiah are concerning this return. Ezra led a group back and the burden of his heart was the rebuilding of the temple. With Nehemiah it was the rebuilding of the wall. In the glowing days of Israel's history, the people of God were numbered by the millions; but it was only a little handful, somewhere around sixty thousand, that returned after the captivity. 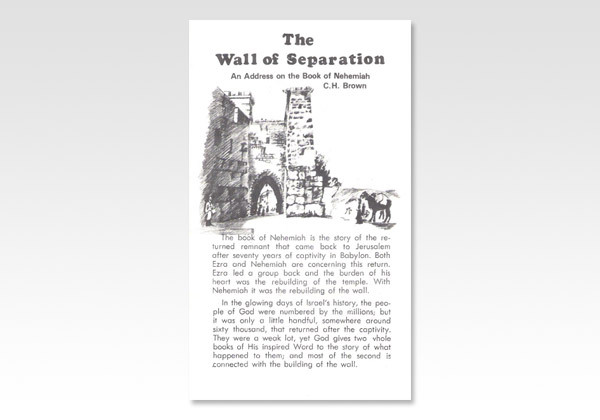 They were a weak lot, yet God gives two hole books of His inspired Word to the story of what happened to them; and most of the second is connected with the building of the wall.